Is the sand at this beach really black? Yes, well almost :). The sand is not exactly pitch black, it appears as if some kind of black dust has been mixed with the normal sand. In the earlier years, the sand looked more blackish than what it looks now. Black Sand Beach is locally known as Pantai Pasir Hitam. In Malay, Pantai means beach, pasir is sand and hitam stands for black, and therefore such name. There are many stories that explain why the sand is black here. A popular mythological legend says that Garuda, a giant eagle picked up the Princess of China to seek some favors. However her fiancé, a Roman prince lodged a war against Garuda to get the princess released. It is said that the beach reflects the remains of the fierce war and therefore looks black. I have also heard some say that iron oxide in the sand causing the black pigmentation, and some wrongly think that washed up black particles from the nearby cement factory is probably causing this. But what is the real cause for the sand of Black Sand Beach turning black? So why is the sand black? Unlike some of the other island beaches where you can see black sands, this is not a case of volcanic eruption. In fact the real reason for the sand to be black here is given on the information boards at the beach itself. There exists huge amount of minerals called Tourmaline and Ilmenite in the granites of Gunung Raya (i.e. Mount Raya). These minerals are run down by the spring water from the mountain and cause the color of sand to turn black. But this phenomena seems to be an exception in Langkawi. It has been observed by the scientists that these minerals rarely cause sand to turn black elsewhere in the world. In fact Ilmenite is the basic mineral used for producing Titanium Dioxide which is ground into powder form to create a highly white substance. It is used as the base in a number of products including in paint and paper. So why is it causing the sand to turn black here? There is no definite answer really. Do you know that Ilmenite has also been found in the moon? Entry to the Black Sand Beach is from the road Jalan Teluk Yu. It is at a short distance to the east of Shark Bay Beach. 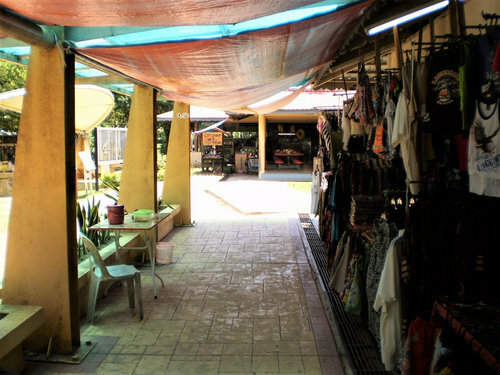 The entrance is through a shopping market which is full of small stalls and shops that are run by local women selling local dress materials, clothes and accessories. There is a staircase that leads down to the beach. After you get down to the beach and look towards right, you will see a fishing jetty. 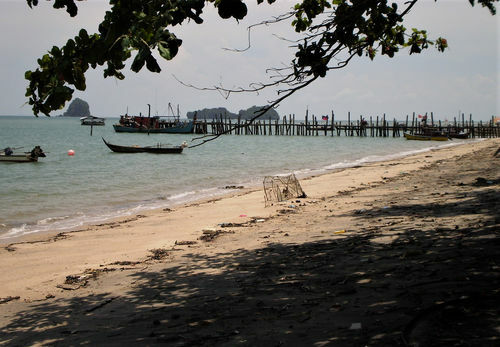 This place has been part of a fishing village and you can see many fishing boats moored there. On the left the beach takes a curvature like a horseshoe and is fringed by forests and trees. From the middle of the beach if you look towards the sea and diagonally left, you can see the mammoth cement factory of Lafarge with the mountains in the background. Well, while the beach is a popular tourist attraction because of its unique color of the sand, it is however not clean and well maintained. Probably it is considered more as a fishing area. The beach is usually full of washed up weeds and rubbish which is not cleaned too often. I would not recommend you plan a swim or sun bathing here. Well, so should you then go to the Black Sand Beach during your vacation in Langkawi. I would say Yes. 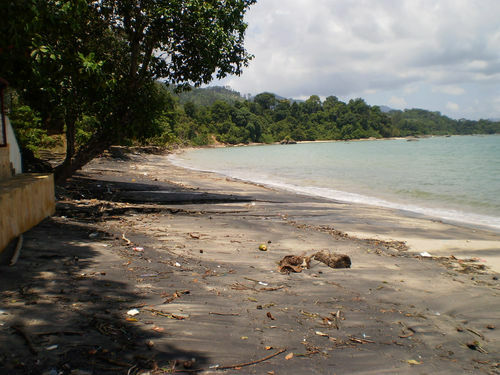 While the beach may not be very clean, where else can you see black sands? Go down to the fishing jetty and stroll along the narrow footbridge made with wooden logs, go right up to the end of the jetty into the middle of the water ... it's a great experience. Secondly this is a cool family place. As I said earlier, there are lots of small stalls and shops here selling all kinds of items which are quite cheap. For example, you can get a locally made typical ladies top for RM20. So if you want to pick up small souvenirs, gifts or clothe materials, this can add up as a nice place to your beach agenda. It's a family beach. 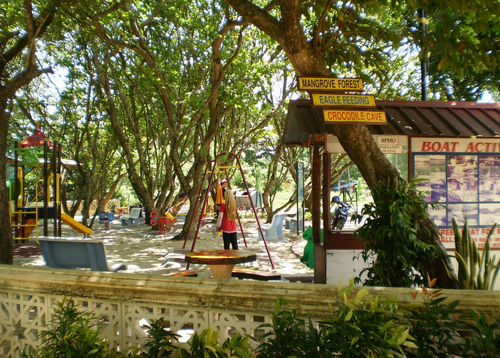 There is a playground for the kids and children. The play ground has swings, slides etc. There is also a counter here that offers boating activities. There is a cafe at the end of the shopping corridor that offers snack items like burgers, sandwiches, ice creams etc. Next to the cafe there is a counter that sells fresh coconut water for RM3 and other fruit juices. The facility also has a newly built pay toilet. Black Sand Beach and the complex is a nice place for the families with kids. While other than the blackish sand there is not much beach activities that can be done here, it is definitely worth a visit. Children have access to the playground, while you can shop, and finally have some good snacks or lunch with your family at the cafe. If you are visiting the Shark Bay Beach, you should make a visit here as well. Black Sand Beach is a public beach, accessible 24 hours and there is no entry fee. The shops and the stalls close by sunset. Black Sand Beach is located on the road Jalan Teluk Yu on the northern shoreline of Langkawi. It is about 20kms from Kuah Town. You can come to the beach by a taxi or rented car. On its west is the Shark Bay Beach at a short distance. See the location of the beach in the below map.